Nothing makes me happier than seeing blooms in my garden. Even though I love gardening, I have had more plants die than have lived. I’ve had many plants refuse to bloom, including my hydrangeas. (That’s a another whole post!) So when I say I am thrilled when something blooms, I really mean it. One plant that I can always count on for abundant blooms is the Shasta Daisy. 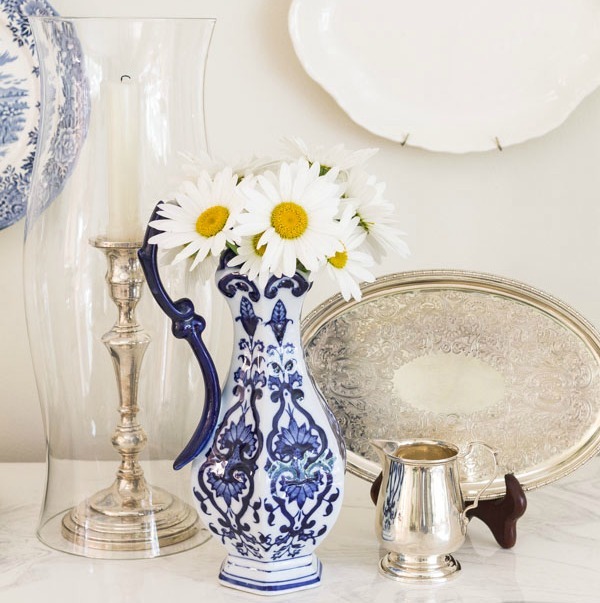 Bringing the blooms in and decorating with daisies is a sure sign that summer is finally here. 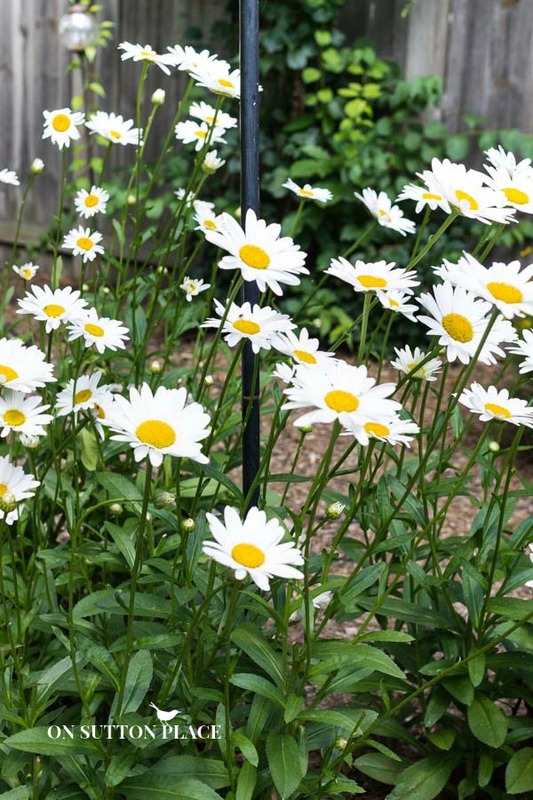 My daisies are “Becky” which is known for its sturdy stems and perfect round blooms. I’ve moved these plants around a few times but it doesn’t seem to phase them. They pop right up the next year. They love sun but begin to wilt if they get too dry. My soaker hose helps with that. It’s important to cut them as far down the stem as possible. I strip the leaves and plop them in a bucket of water as I cut them. If you have even 2 or 3 plants, you will have enough daisy blooms to use them on their own in a favorite pitcher. 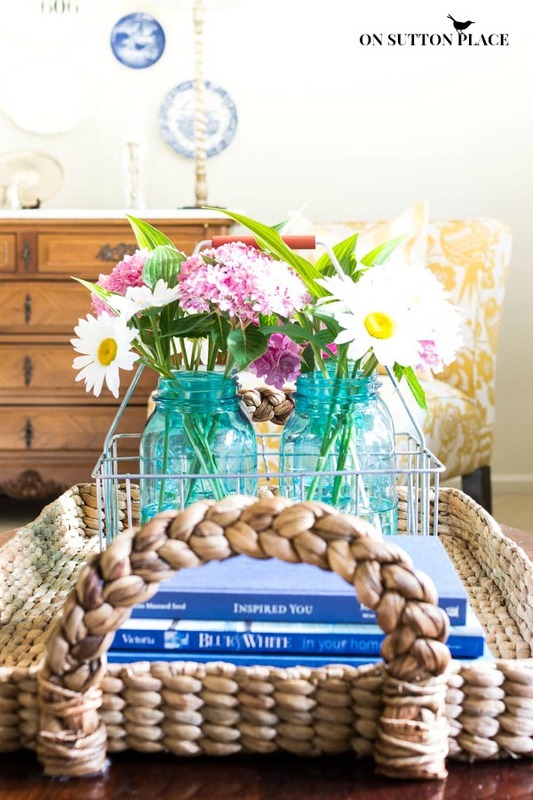 I always like to pair daisies with blue (shocker!) but they really do look good with anything. Sometimes in the summer I break my “what goes on the counters” rule and add fresh flowers. We all spend so much time in our kitchens that a pretty touch on our counter makes sense. I usually only have functional items on my counters because I don’t have much space…but if something makes me smile I try to find room for it! 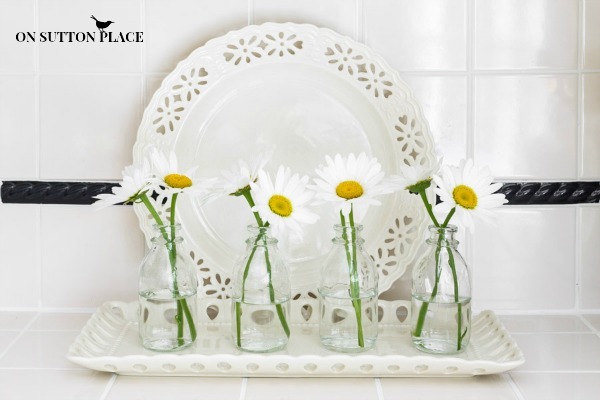 Because of their thin stems, daisies are the perfect bloom for bottles. 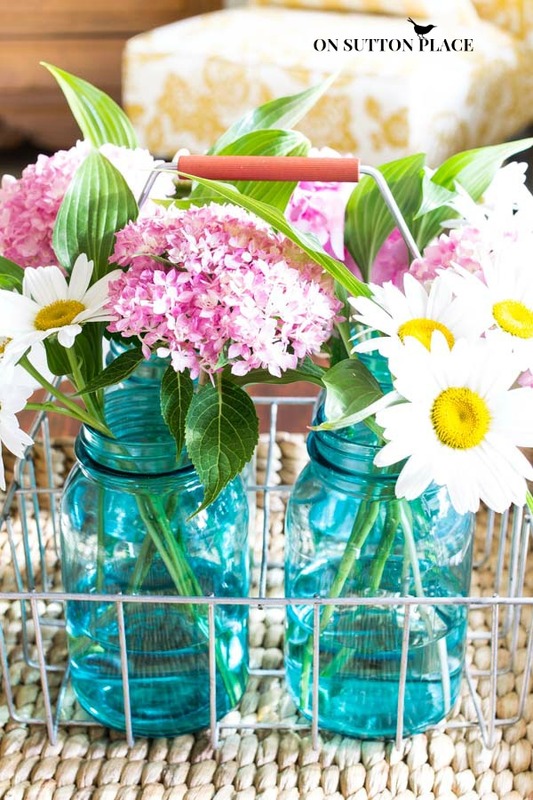 If you have vintage, mismatched bottles get them all out and add a daisy or two. I got these little clear bottles at Hobby Lobby last year. They have come in very handy. 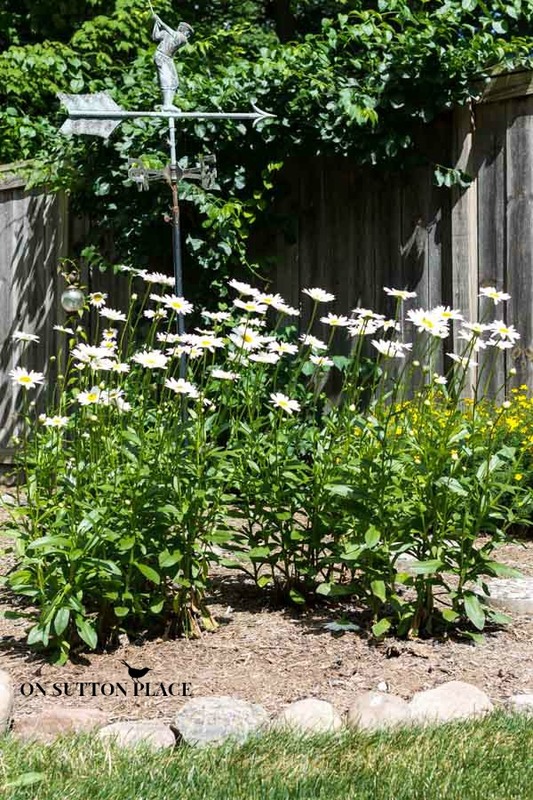 If you want to start a perennial garden, or just add a few plants to your landscaping, I highly recommend Shasta Daisies. They do need sun. The only care they will need is perhaps thinning out in the spring. If you don’t enjoy gardening but love fresh flowers, pick up a bunch of daisies at the grocery. They will last for days and days if you change the water a few times. Snip the ends off too. I’ll be back on Sunday, I hope, with a recipe of some sort. Still thinking about it! Thank you for taking the time to visit me…wishing you all a perfect weekend. I love Shasta Daisies. My Dad always had them in his garden, and I have them in mine. Every time I look at the beautiful flowers, I smile as the lovely memories of Dad in his garden come to mind. Your Pictures are beautiful and the arrangements lovely. Soooo pretty in the blue jars! Wish I had a sunny spot for lots of perennials! I love,love Shasta Daisies. They have always been my favorite flower for summer. Unfortunately, we live in a area where deer are in my yard day and night, so I’ve given up on planting flowers. We hope to fence our yard in the near future and I’ll certainly start my daisy bed up again. Thanks so much for sharing your beautiful flowers today. Just a comment on Sue’s post, we have a very large deer population in our area and although we love seeing the deer in the winter through our big picture window in the kitchen they can be very unwelcome come the spring and summer when they eat all my plants. I use a nonchemical, organic spray to keep them away from my hostas, tiger lilies and black-eyed susans. In fact, I could not understand why I wasn’t getting any blooms on the above plants until I saw the nipped buds! The spray works, but when it rains you have to get out there and spray again or the deer will be back. This year I put a Shepard’s hook and a wind chime a few feet away from the plants mentioned to see if maybe when they hit the chime it will scare them away. It seems to work! Thinking of getting more chimes to set up. Well, my son is a landscaper and he was going to discard a Hydrangea plant in our woods that he had pulled from a customer’s yard. I snagged it and although it looked scrawny I planted it. I trimmed it a little and the next year it did not bloom, left it thinking I will have to pull it out bc it wasn’t going to take. This year I have 3 blooms on it! I guess the secret is to not trim it back and wind chimes for the deer! A little bit of spray doesn’t hurt either! I just love your daisies, Ann. I’m beginning to work in our flower bed, got the weeds pulled today, and took 2 plants out of the pots that they’ve been in for several years. It’s looking better already. 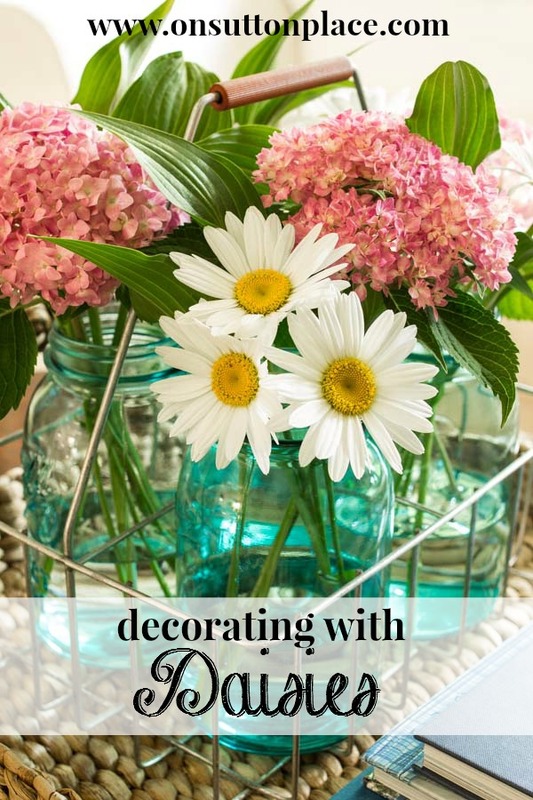 I don’t know why I haven’t planted Shasta daisies before now but your post is reminding me that I need to do so! I have had fewer blooms on my hydrangea bush this year but I attribute that to the unusual cold weather that we had this past winter. I never cut the bush back because I understood that it bloomed on old and new wood. I too look forward to the sunshine of my daisies each year. I shared some with my cousin one Sunday and she called to tell me how spirit lifting they were in the house. My hydrangea did not receive a cutback last fall and this year I have a beautiful green ball with no blooms. That plant food might just be what is lacking. Your comments just always hit the mark. Keep them coming. Thank you for the Daisy post. It is just lovely. I have a hard time choosing a favorite flower. I love dahlias, hydrangeas, roses, the list could go on and on. 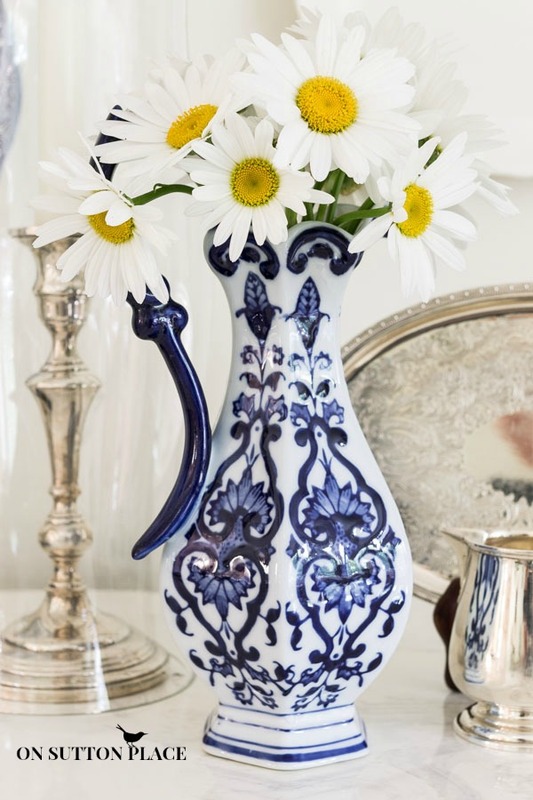 I have daises in a pretty sapphire blue vase on one of my end tables right now. I love them. As Meg Ryan said in You’ve Got Mail, “Daisies are such a friendly flower, don’t you think daisies are a friendly flower?” That quote has stuck with me because it is so true. I used daisies in my wedding almost 40 years ago. I still love them as much today as I did then, probably even more so. Thanks again. Your shared creativity always delights my day and brings sunshine to my heart. Just like a daisy! Enjoy your weekend. Beautiful arrangements Ann…they all look so pretty! Your daisies are beautiful. They always remind me of my Grandmother. Nothing says summer like daisies. 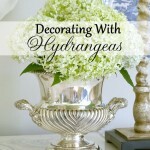 I had planted hydrangias because my grandmother had some. Well, I discovered that deer will walk by other plants for those tasty, tasty hydrangias. They must taste like candy, ’cause I never got a bloom at my old house. I should plant some here, since there are no deer. I have some daisies and you’re right, they are hardy! When my cat, Ernie, was alive, I could NOT put flowers in a vase since he would have to drink from the vase and either bend the stems or knock over the vase. He even drank water from the birdbath or the dew off the leaves outside. Oh, and forget having a glass of water with him around. Gosh, I miss him, he was a character! Daisies will RE BLOOM if the spent flower and partial stem is removed. Don’t wait too long after the first flower has faded so the plant has energy. Have been told this numerable times, but haven’t put to the test. But I believe. Should run out and do this now… thanks for the nice pictures Ann. Yes I know! The more you cut them the more blooms you get! You know, Ann, your kitchen countertops and cabinets always look spotless and so fresh. 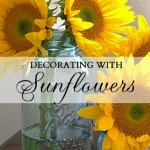 I love all the vignettes you do with your homegrown fresh flowers! Flowers say happy and you seem to be just that from your posts. Thank you Jeanette…what a nice thing to say. 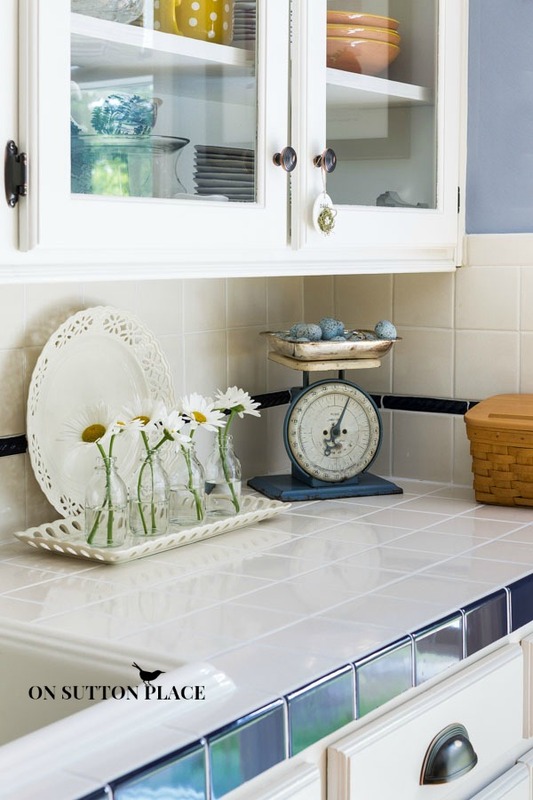 I am a stickler for keeping my kitchen clean…but please don’t look in my closets or garage. They are a nightmare! My Hydrangea are doing great this year, but Hostas are getting eaten by slugs and ear wigs, and even my pansies are full of ear wigs! It’s horrible! I can relate to loving gardening, but having more plants die than live. Your daisies are so pretty. I especially love them in the row of clear bottles. I’m so glad to hear that I’m not the only one who can’t get her hydrangeas to bloom! 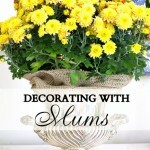 I’m beginning to think that sticking to those old fashioned flowers like daisies – always a success and so beautiful! I have hydrangea all around my yard that have never flowered. During a winter snowstorm I was watching the Cottage Farm presentation on the QVC shopping channel and was smitten by their hydrangea food. I bought and have used it monthly throughout this growing season. My plants are beyond beautiful with gorgeous flowers. It really, really works. I have no affiliation to them at all. Here is the link if you would like to take a look…not cheap but it has worked so well! I honestly was about a week away from having my hydrangeas removed. I will order this food and give them one more shot. I never know if I should cut them back in the fall or not. I didn’t last year but they still had no blooms. 2 of them actually produced big buds but then they never opened. It was so frustrating! Thank you for sharing this. I am ordering right now! Ann, When you open the box of feed, they are little pods that contain just enough fertilizer for one feeding. I pop one into a gallon sized milk jug, fill it with water, shake until dissolved (it turns blue), and then apply the entire gallon to the base of one plant. I couldn’t find how much to apply at one sitting so I just put the entire gallon on it. It seemed like within a few days the hydrangea greened up and got bigger/fuller, and within a few weeks I had lots of buds which have only begun to open in the last week or two in my area – they are so incredibly beautiful! Several of my hydrangea were Christmas decoration plants that I nursed through the winter and planted out in the garden – none of these are available in the local nursery. I sure hope it works for you! Let me know! Also, my big hydrangea bush I cut back every fall, only to find out that I shouldn’t have cut it back because that stopped the budding! I did that for years until I leaned that I shouldn’t. From now on, I am just going to leave them alone! Don’t you love Farm Fresh? I just can’t get enough of their pics! They look just perfect Ann. They grow wild in my field and I always love to cut them. Pinning! I love daisies–they seem to be such a “happy” flower, if that makes sense. I had never thought of using hosta leaves as a filler before. What a great idea! 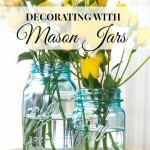 I truly learn something every time I stop by your pretty blog! Thanks for all the ideas and inspiration. You are most welcome and I agree. Daisies just scream HAPPY!